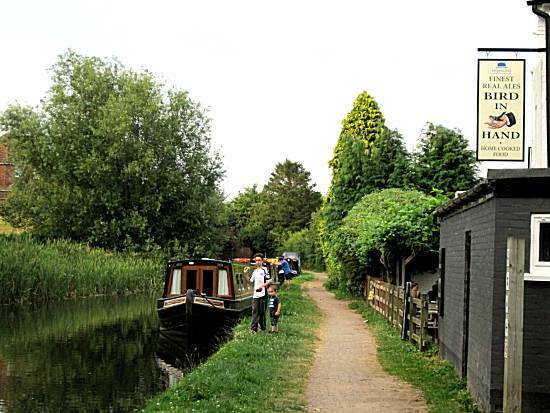 The intrepid narrowboating crew of international fame, having already conquered the inland waterways of Great Britain, were keen to demonstrate and share their skills once more to the world. Against the advice of many, they have elected to navigate the ‘Stourport Ring’ with two new crew members, Tom and Ed. 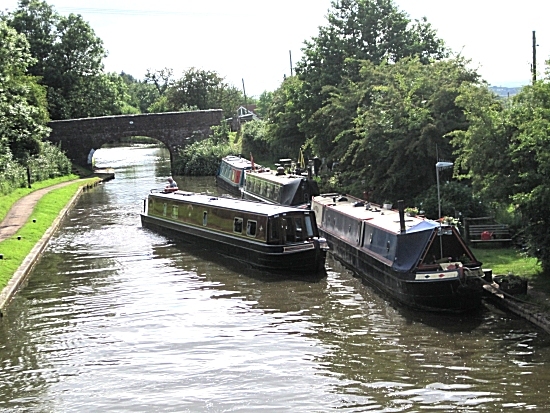 They cast off on Saturday afternoon 27th June from Stoke Prior in the Bromsgrove District of Worcestershire. 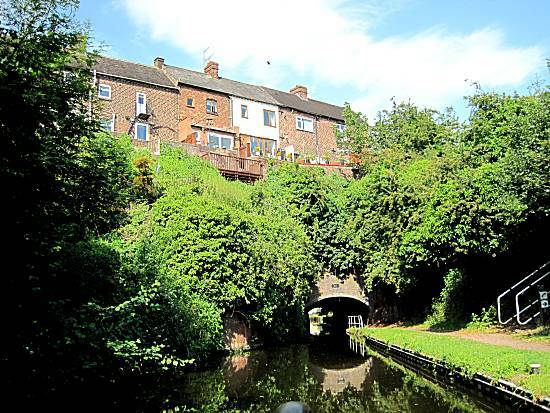 In the first afternoon alone, they must conquer the treacherous Tardebigge flight of 36 locks, lifting the 30 ton narrowboat up some 67 metres over Lickey Ridge. The second day will require them to traverse the entire length of the Wast Hill Tunnel, built in 1796 and last measured at some 2,726 yards. 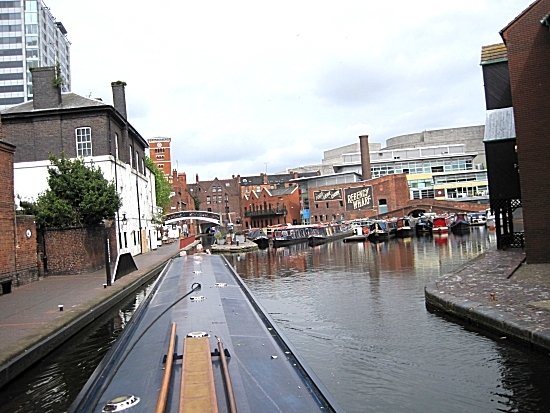 Should they survive this section they hope to reach the very heart of Birmingham and relax in the Gas Street Basin area. 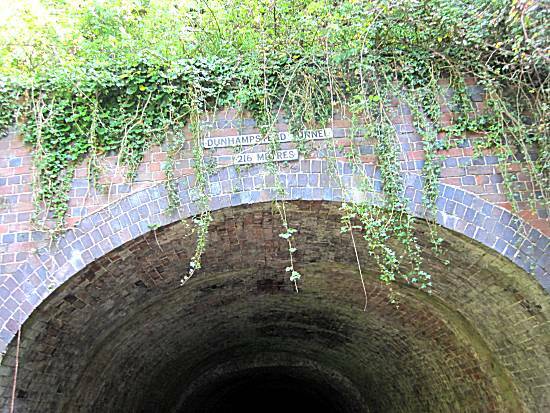 The torture will continue though with navigation of the spine chilling ‘Netherton Tunnel’ at an even longer 3027 yards, before reaching the relative safety of Dudley. Later in the week the narrowboat will be lowered in a dangerous staircase lock system into the fast flowing River Severn, where the crew, Alan, Ron, Tom & Ed, hope to reach Worcester in just one day. The crew met at Alan's house at 9am, rapidly departing southwards into the unknown danger (and Morrisons, Bromsgrove). The diversion into Morrisons proved to be fruitful with procurement of healthy supplies, commensurate with their intrepid status, including lettuce, tomatoes, bananas, nectarines, porridge and orange juice (with juicy bits) Minimal quantities of Pork Pie and Hobnobs were also obtained. 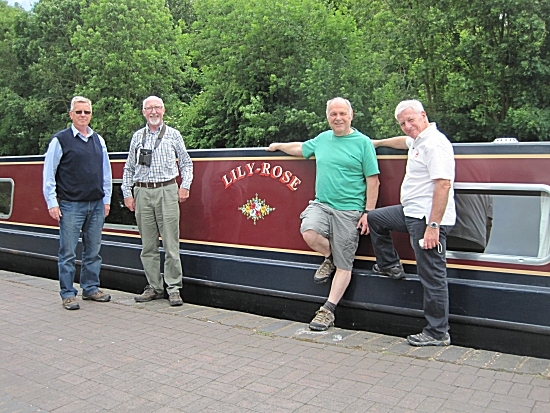 On arrival at the boatyard the staff welcomed the experienced crew and quickly allocated the narrowboat "Lily-Rose" to the crew for the week. The crew were most impressed with the superior facilities on board. As usual, the boatyard staff waived the normal safety instructions, instinctively knowing their incredible skills. 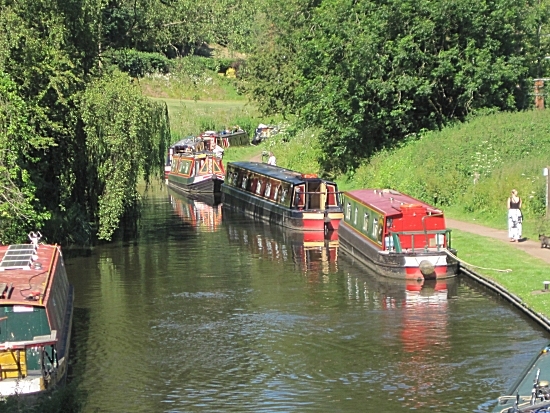 Within seconds of departure the narrowboat arrived at the first lock indicating the start of the ascent of the feared Tardebigge flight of 36 locks. The crew were dismayed to find another narrowboat pull out in front of them and soon learned that they were planning to benefit from their rapid ascension of the flight. Members on board the other boat were amazed at the speed that the crew navigated their boat over Lickey Ridge, lifting them some 67 metres. The locals appeared in crowds cheering the crew along the route, amazed at their incredible boatmanship. 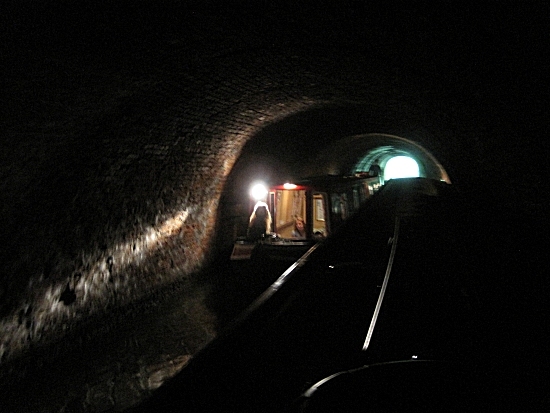 The crew required no rest at top lock and continued at speed through the Tardebigge and Shortwood tunnels before reaching their planned destination for the night at Alvechurch. A disaster was avoided by the heroic actions of Tom when he avoided a collision with a narrowboat in the tunnel, having inexperienced crew. 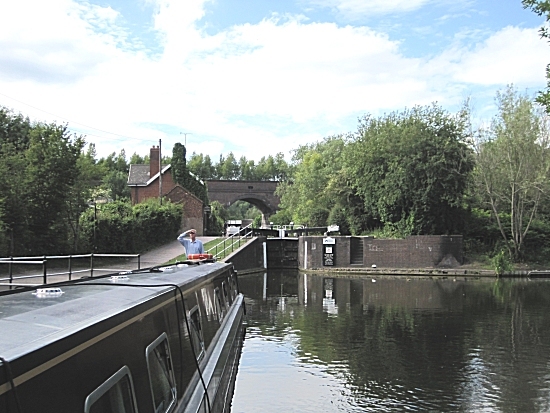 Life got easier for Tom after leaving Shortwood Tunnel, when he realised that the Alvechurch moorings were getting close. Disasters occurred at both 'The Weighbridge' and 'Red Lion' pubs, when the crew were advised that the kitchens were too busy to serve them food!!!! The disgruntled crew travelled quickly to the 'New Dilshad International Indian Restaurant where they greatly enjoyed excellent curries with Cobra beers. 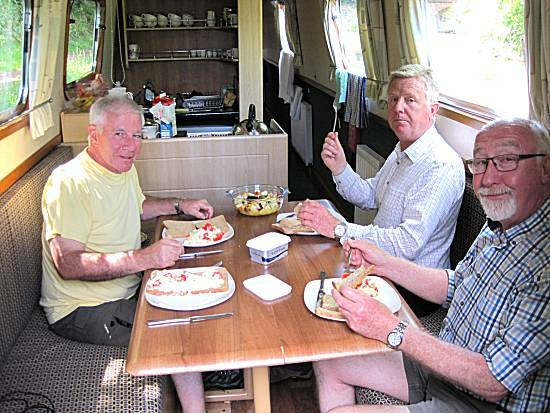 The crew returned to their narrowboat to share their heated political views until a very late hour. They knew that the feared Wast Hill Tunnel lay ahead of them for the following day and retired to their beds to contemplate their successes. The crew awoke at an early hour and Ron, under guidance from Tom, prepared positive potential porridge for the crew. They set off in the light rain passing numerous moored boats with crew still asleep on a dull Sunday morning. 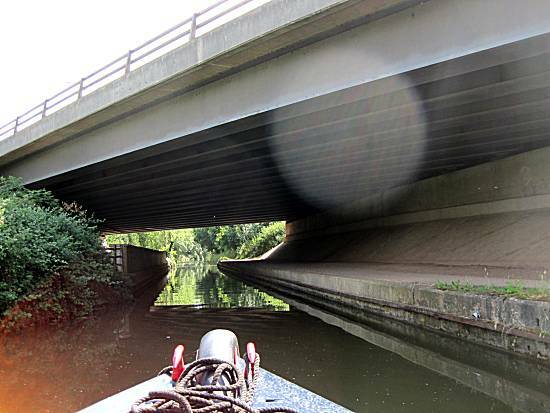 When passing under the M42 motorway, the crew found their passage blocked by a burned out and sunken narrowboat. 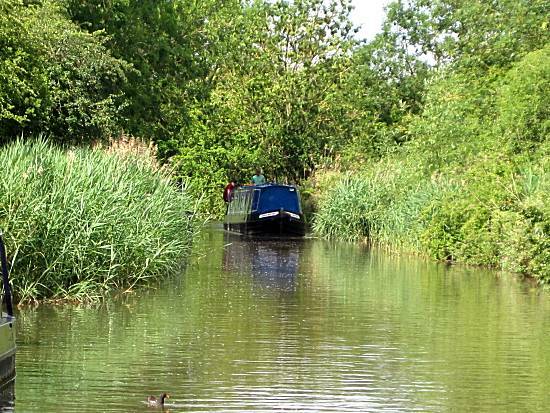 The crew knew that this could so easily happen when narrowboats are in the hands of inexperienced crew. The crew quickly and efficiently re-floated the boat and dragged it to the side of the canal, thus re-opening the waterways to others. 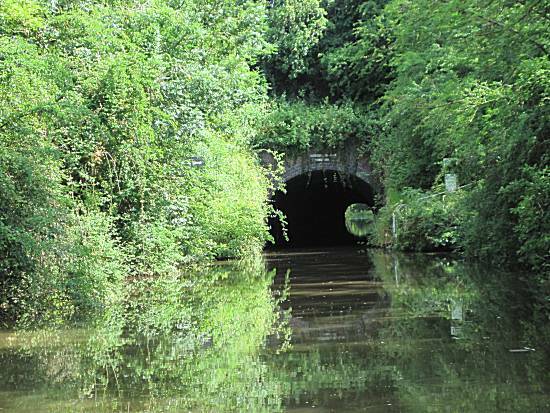 Only too quickly, the feared Wast Hill tunnel came into view and Ed could be seen hiding as he knew that not one, not two, but three other narrowboats must be passed before they would emerge in the delights of Kings Norton. After the traumas of Wast Hill tunnel, Ed prepared a cafetière of coffee for the crew, which was shared with the last of their congratulatory Mars Bar Crispies. Life was good upon the Lily-Rose. As the narrowboat was passing Bournville, Tom had a thought!!! 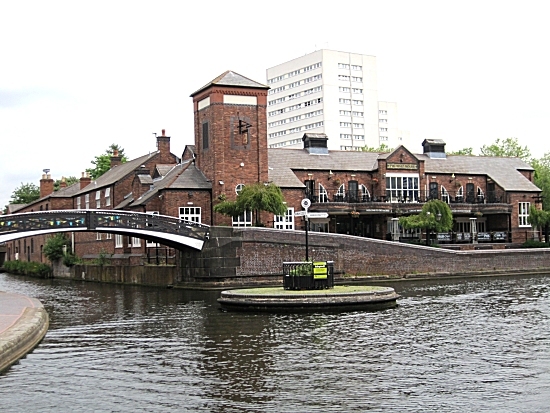 Quickly using the ship to shore radio he communicated with his son who organised a daring collection of the crew as they passed the University of Birmingham campus. 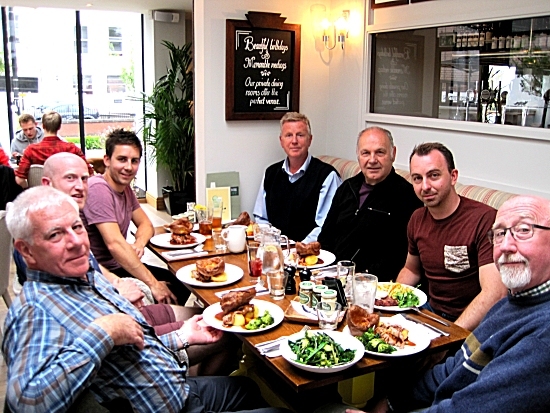 Tom (Tom's son), together with his friends Alex and Luke efficiently whisked the crew, in waiting cars, to a Gasto Pub, where, in recognition of their incredible boatmanship, they enjoyed roast lamb and beef Sunday lunches accompanied by Timothy Taylors ale. 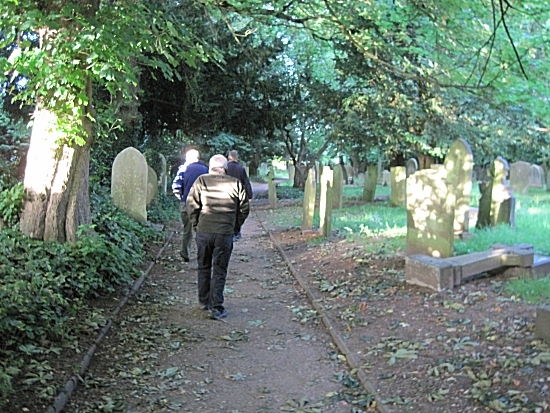 Afterwards, they were transported to 'The Bell' in Harborne, where they whiled away the afternoon and most of the evening consuming Adnams Ghost Ship ale. Leaving 'The Bell' the crew started the long walk back to the boat, through dangerous churchyards and long winding roads, but they arrived in sufficient time to enjoy some cheese and biscuits and a little red wine. The crew were aware that this enjoyable excursion has put them behind their torturous schedule, but drifted into a relaxing slumber unaware of the consequences. The crew awoke a little later than planned, but after Ron's pivotal porridge, felt ready for another testing day. 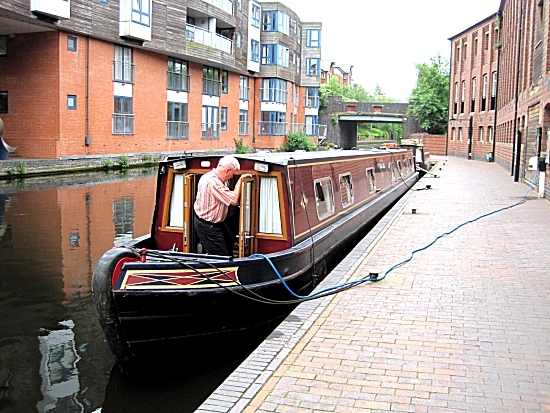 The crew felt that only a short stop in the centre of Birmingham was justified and therefore cunningly stopped to top up the fresh water tanks to the very brim. 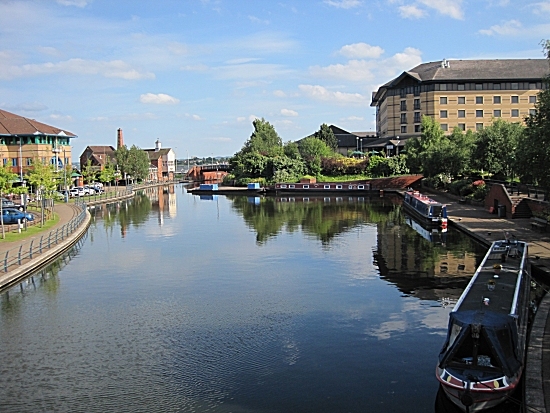 The crew were uplifted by the views of Gas Street basin and the Malt House, where they had previously spent many a happy hour. The crew moored for a short period adjacent to the National Indoor Arena and carefully studied the available coffee shops in the area. They selected Cafe Nero for excellent coffee with croissants (except Ron). They left Birmingham around lunchtime selecting the Main Line out of Birmingham towards the dreaded Netherton Tunnel!! 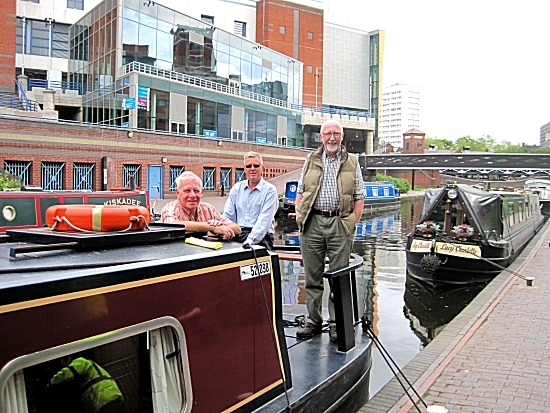 Leaving Birmingham the crew concluded that a Pork Pie and Smoked Mackerel Salad would be the only thing that would sustain them during the Netherton Tunnel and instantly moored adjacent to Albion Bridge, whilst Ed prepared the food. Afterwards they felt that a healthy fruit salad would complete the protection and Ron quickly obliged. 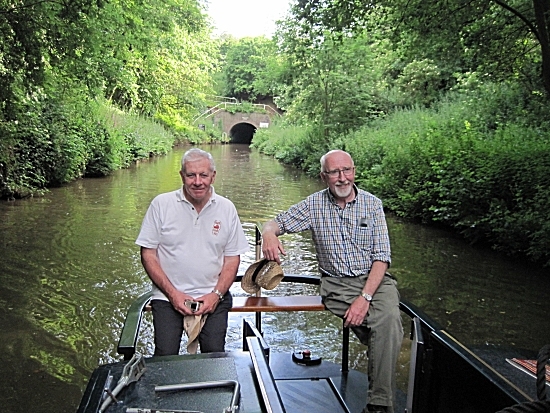 Alan took the controls as the Netherton Tunnel came into view. He selected the highest gear and decided that warp speed would minimise the stress on the other crew. The locals kept the entrance of the tunnel clear and did not permit any other boats to enter. 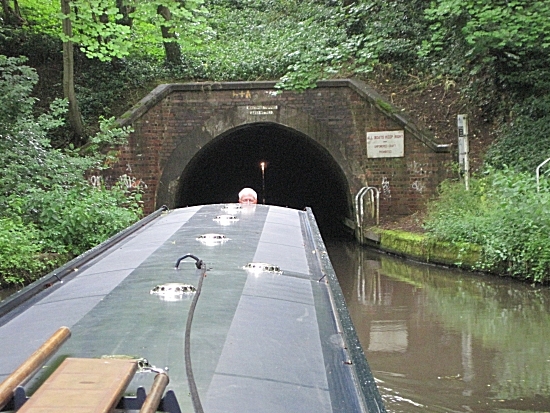 Transition of the tunnel was both rapid and effortless and the crew were pleased to arrive in Dudley in excellent shape. 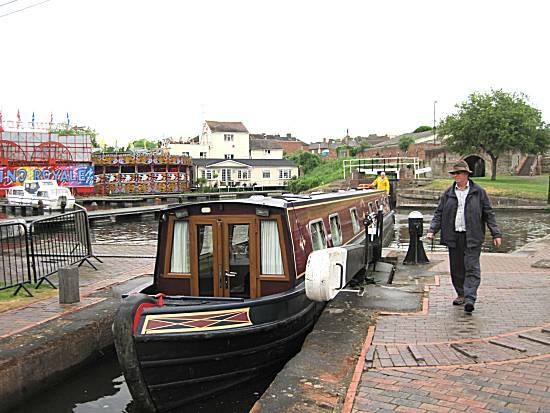 Alan left the boat to guide the crew into moorings in Waterfront, Brierley Hill where the locals had opened a Wetherspoons in their honour. Google advised that it was 62ft from the boat!! It was obvious that the authorities were out searching for the crew, as it was considered that no one could have made that much progress under the impossible conditions. 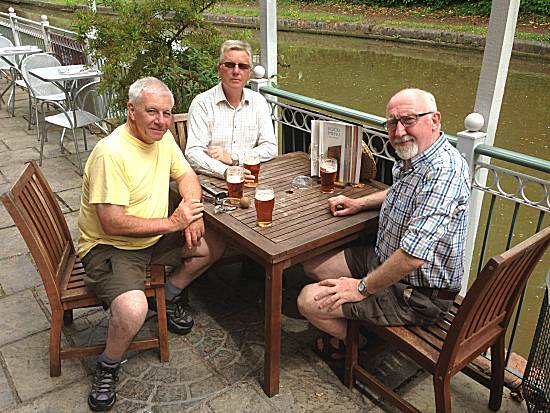 The crew retired to the safety of Wetherspoons, where they enjoyed steak, mixed grill and gourmet beefburgers, together with Abbots ales, before returning to the boat for some healthy discussions late into the night. The crew were pleased with their progress, but set themselves an ambitious target to reach Kinver for Tuesday night. The crew awoke a to bright sunshine eager to consume Ron's practical porridge, whilst Alan started the engine ready for the Delph Locks (8) and the Stourbridge flight of 16 locks. Alan guided the boat out of Waterfront to the tearful cries from the staff at Wetherspoons. 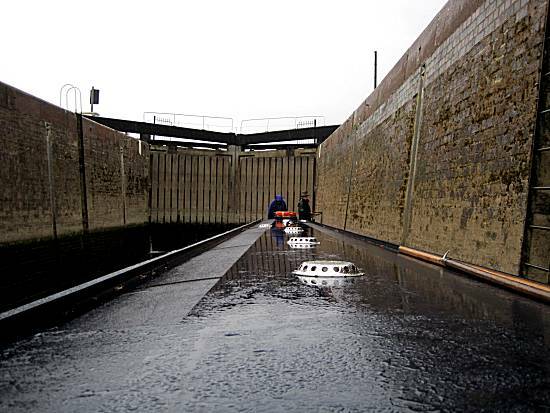 The crew were humbled to find that the locals had allocated a person to assist with the locks during their passage down the Stourbridge flight of locks allowing a record time to be achieved. 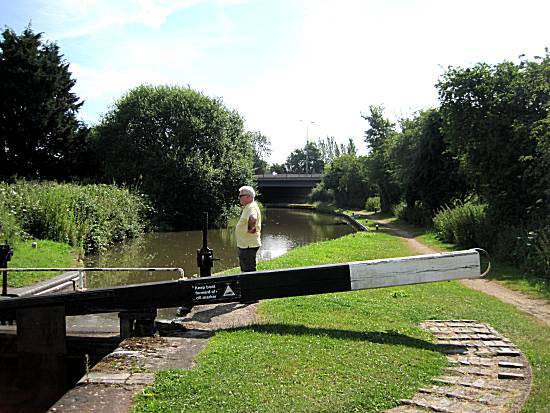 The completion of all 32 locks indicated that the narrowboat must make the tight turn at Stourton Junction into the Staffs and Worcester canal, which was accomplished flawlessly by Ron. Tom felt it necessary to leave the boat as it passed under the Dunsley Tunnel, but no collapse occurred. 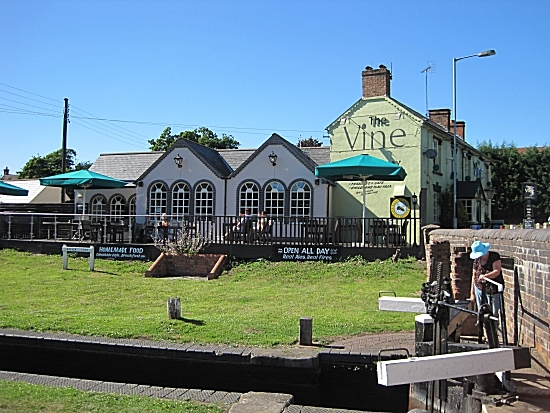 At an incredible 4:15pm, the boat passed the lock adjacent to 'The Vine' in Kinver, their planned stopping place for the evening. 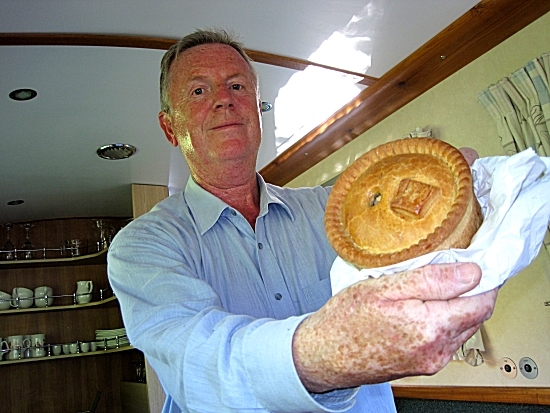 Ron returned from a Spar shop very proud of his purchase of a giant pork pie, together with tomatoes, eggs, sliced meat, cole slaw, bottled water and bread. They rapidly prepared for showers after the exhaustion of the day in the 28 deg sunshine. They all looked forward to a night of entertainment at 'The Vine'. 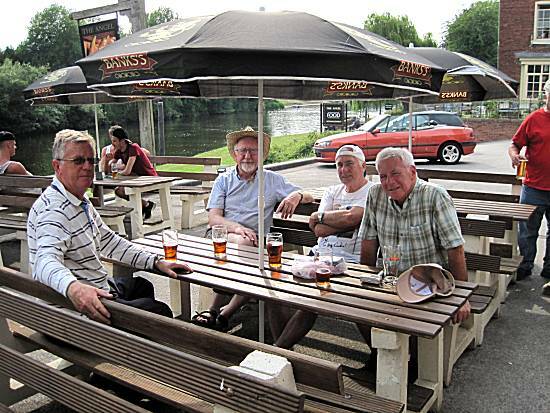 The crew were initially impressed by the array of real ales on offer at The Vine, but were disappointed when the barrel ran dry of their first selection. Disappointment turned into despair, when their second selection also ran dry before a single pint had been drawn. The pleasant girl returned to advise that although they had had beer delivers that day, it had not stood for the statuary 24 hrs, before connection and that the crew would have to put up with the other two mediocre ales. Despite this set back, the crew enjoyed gammon and fish & chip dinners on the upper decking before returning to the boat at an early hour. The crew were critical of the way that the pub was run and were mildly disappointed by their overall experience. 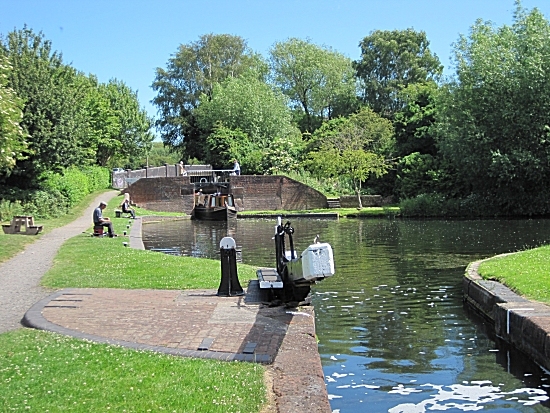 Only limited success was achieved when they attempted to view the highlights of Wimbledon and the 10 o-clock news and the crew instead studied the charts for the following day where they hoped to reach Stourport. They knew that this would involve travelling through Kidderminster and crew therefore retired for an early night to gather strength. Due to their early night all the crew awoke at an unearthly hour, with Tom making an excursion to the Spar, to purchase a Guardian. He failed in this task, but instead returned with a Telegraph, much to the approval of the other crew. The crew declined bacon butties at the Vine at only 99p in favour of Ron's perfect porridge. The gruelling journey continued, lock after lock, but their highly secret advanced locking procedure paid dividends. 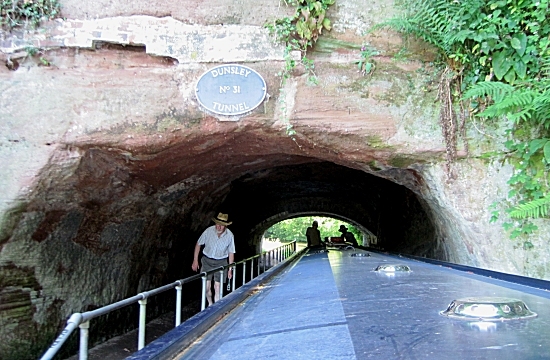 The locals feared collapse of their houses as the canalboat travelled beneath through the Cookley Tunnel (65yds). 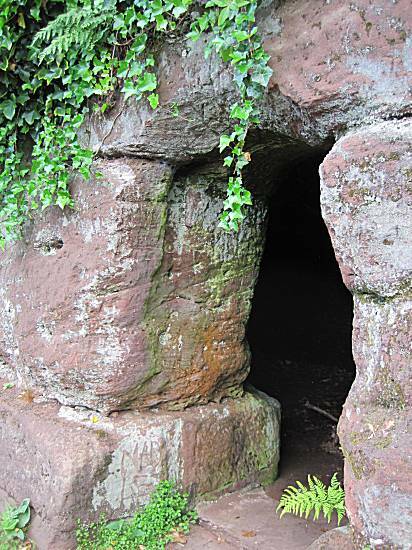 The crew were grateful that the locals had constructed a cave hide out in case of disaster. Due to their unbelievable progress the crew decided to stop briefly at 'The Watermill' on the far side of Kidderminster, for a swift pint. They settled in for quantities of Banks Best Bitter, which was greatly enjoyed in the hot sunshine. They took advice from a local called Brian, who related stories of giant pubs by the side of the River Severn and the crew were greatly intrigued. Brian agreed to take them to a giant pub in return for a share of their giant pork pie salad, which the crew immediately agreed to. 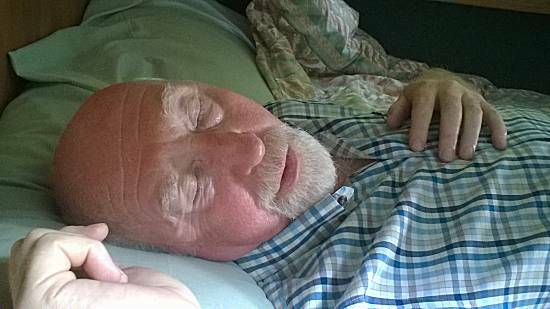 Brian travelled with them on the narrowboat to Stourport, but the crew instructed him to stay inside during the dangerous locking procedures. Brian recommended that the crew moor outside the 'Bird in Hand' and proceed on foot. The crew enjoyed curry meals in the pub to a high standard, except Tom who went for Faggots. The landlord agreed to keep the bar open so that the crew could watch the womens' England v Japan semi-final which started at Midnight. Most of the crew arrived back at the boat after England were defeated 2:1, at approx 2:15 am. A DISASTER OCCURED during the night when the crew realised that central heating had been inadvertently switched on and the boat became a sauna!!! The off switch could not be located until the morning. The tired and exhausted crew awoke at a late hour for nourishing porridge. Ron had made a daring visit to Lidl and obtained further milk and water supplies, together with some Chicken Tika Pasta Salad. The remainder of the crew were amazed at his wisdom. 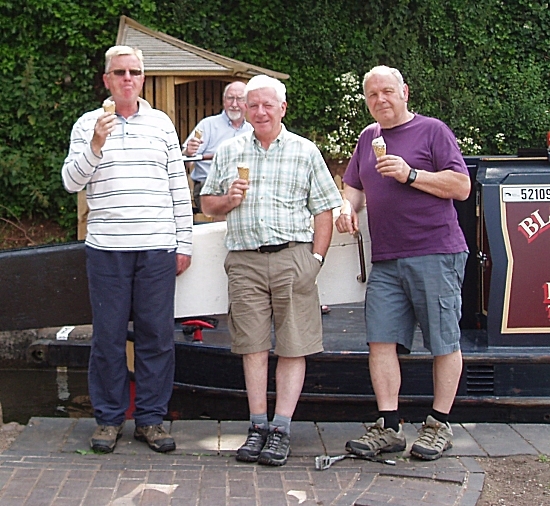 Brian joined the boat again, with his bicycle, to provide guidance down to the complex Stourport Basin, where the crew filled their fresh water tanks to the very brim to increase the stability of the boat for the rough conditions ahead of them on the fast flowing River Severn. 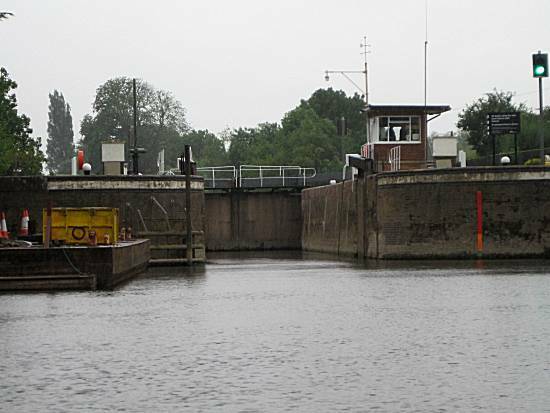 The 2 sets of staircase locks that would lower the 30 ton boat onto the River Severn, presented no problem for the experienced crew. 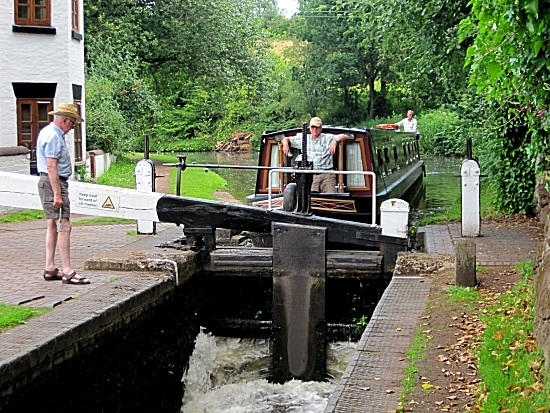 The locals were amazed to witness Ron's magic 'Rope Trick', that aligned the boat precisely for entry into the second staircase lock. 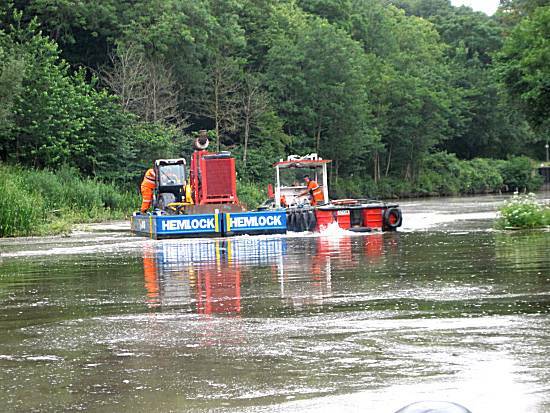 As the narrowboat was about to hit the current, the crew were grateful to find that the locals had provided special machinery to minimise the impact on the vessel. 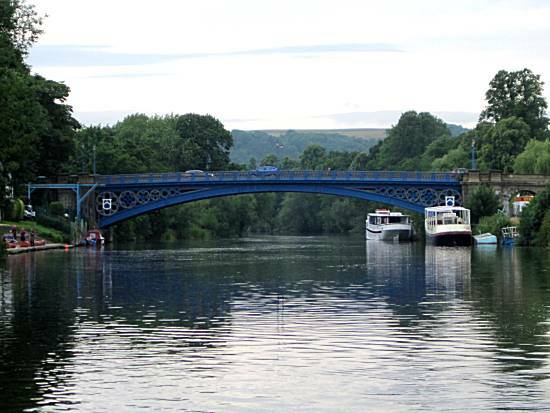 The crew were also humbled see that giant steel Stourport Bridge had been re-painted blue in their honour. Once the crew had adjusted to the difficult river conditions, they quickly moored to prepare a healthy lunch of Ham, Cole Slaw, Chicken Tika Pasta and Tomato, together with River preventing Cup-a-Soups, with bread and butter. Before too long, the giant electrically operated locks came into view, but the crew were not perturbed. 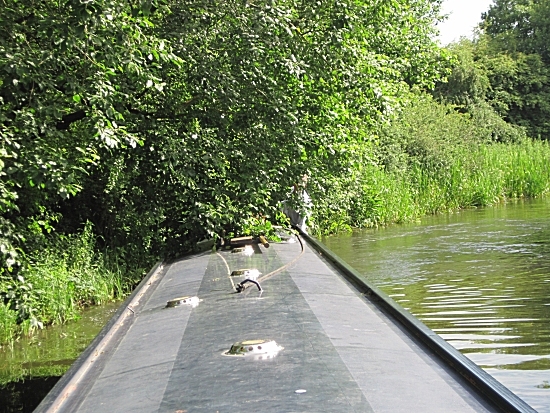 The crew immediately spotted the cunningly hidden entrance to the newly reopened Droitwich Arm. 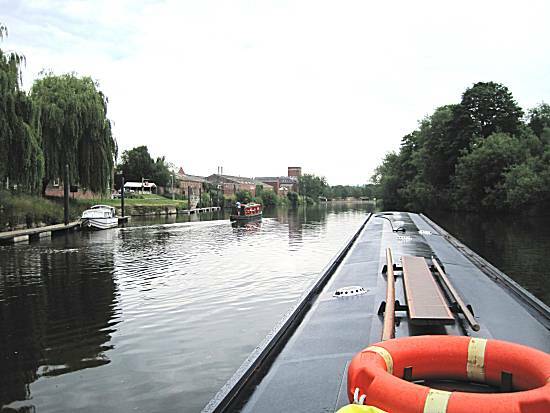 Soon the crew saw Worcester Cathedral in the distance and prepared the boat for the perilous turn into the Worcester and Birmingham canal. The locals could be seen at intervals in very long rowing boats welcoming the famous visitors. 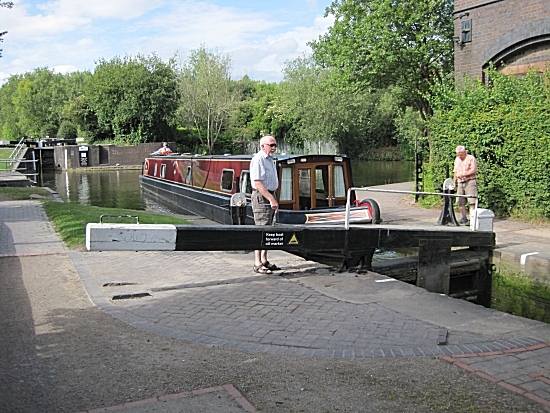 Ed elected to make the turn, cleverly passing close enough to the landing stage to drop Ron and Alan off to open the lock. Once safely off the river the crew sighed with relief and quickly moored, looking forward to a night in Worcester. A unanimous vote selected chinese food for the evening. Using Tom's superior knowledge, he selected the 'Cheng ye' restaurant for their evening's entertainment and they set off under guidance from his mobile phone. Despite an unusual route the crew arrived and were welcomed into pleasant surroundings. They selected a 'B' Banquet, together with initially chinese beers and enjoyed the food that had been prepared to a high standard. 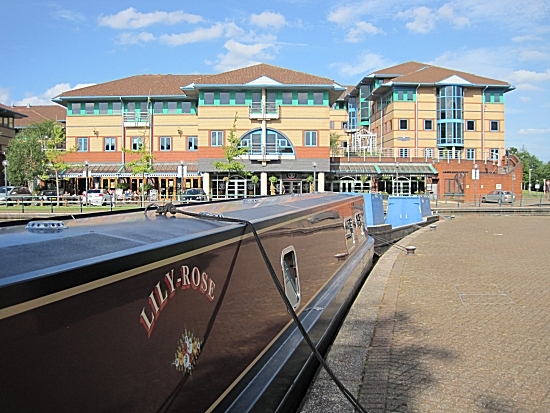 The crew were worried about their final day's cruising in the morning and were unable to consider more ale and returned to the boat for much well earned rest on board the Lily-Rose. The crew awoke before 7am desperate to start their last day's cruising. Having seen a large number of other Black Prince boats in the area the crew were acutely aware that any one of them might steal their lead and scupper the mission. Alan therefore went on foot to open the first lock and after porridge the Lily-Rose quietly slipped her moorings at 7:30am. The crew were alarmed to see a boat hiding in the undergrowth. They instinctively knew that this must be a spy boat with intentions to destroy their mission. Although extra speed was applied, the crew were unable to shake them off. 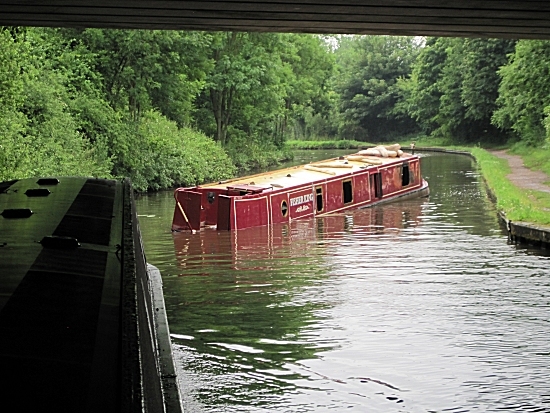 He cunningly hid the narrowboat beneath the M5 until the danger had passed. The other crew were grateful for his actions. After the dangers of the morning, the crew attention turned to food and the contents of the gallery and fridge were studied by the hungry crew. It was noted that there were: 10 eggs, a little Chicken Tika Pasta, some cole slaw, tomatoes, quite a lot of cheese, some fruit, orange juice and cup-a-soups. The crew contemplated on what they might prepare for their last lunch!! Hiding amongst the trees the crew were disturbed to the see the Dunstead Tunnel (216 Metres). 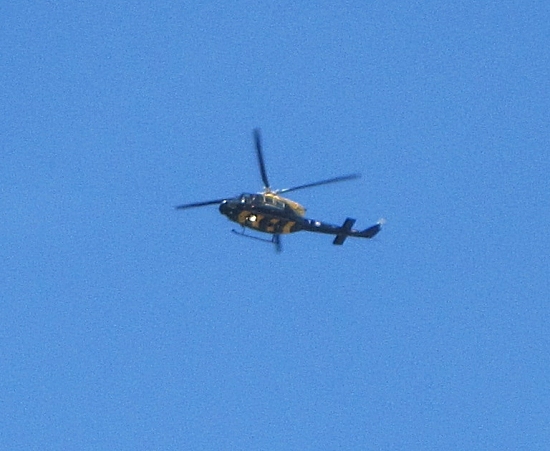 Not surprisingly no other boats were seen in the area. The next dozen locks were accomplished in a textbook manner and just after bridge 42 the narrowboat moored for it's last overnight stay. Immediately the crew departed to the Boat and Railway for celebratory drinks of Banks Bitter. 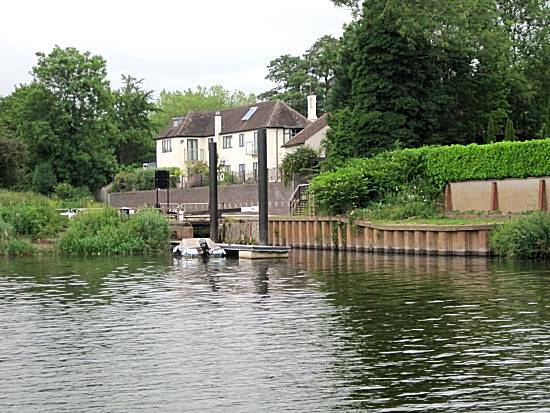 The crew knew that they have beaten the Inland Waterways of Britain once more. The staff of the establishment laid on a feast for the brave crew and they knew that they were were in for a night of great merriment and festivities. Surely nothing could go wrong now!! The stresses of the mission proved too much for Tom, who was found slumped on his bunk after returning from the Boat & Railway. Will Tom survive the 15 minute journey back to the boatyard or should they abandon the mission now!!!!!!! 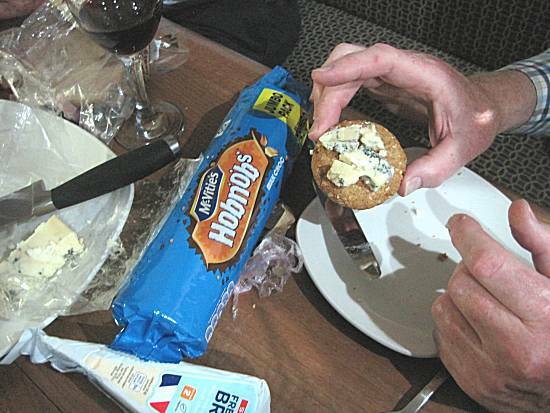 When preparing their usual after dinner cheese and biscuits, it was found that there were no cheese biscuits left!!!! 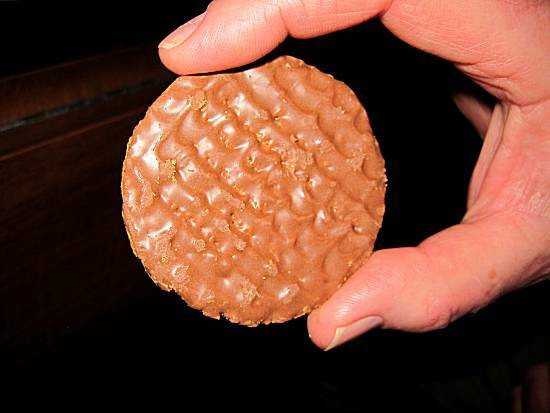 However, Tom, having recovered a little, saved the day when he discovered that Hobnobs were a satisfactory alternative!! The crew awoke from a traumatic night after being kept awake (except Ron & Tom) by thunder & lightening and torrential rain. They were unable to face porridge and instead cast off to make the short journey, with one lock, back to the boatyard where a reception committee were there to congratulate the crew on another successful mission. After paying just £68-05 for their fuel, they loaded their belongings back into Tom's car and headed home to their loved ones, waving goodbye to the adoring locals. 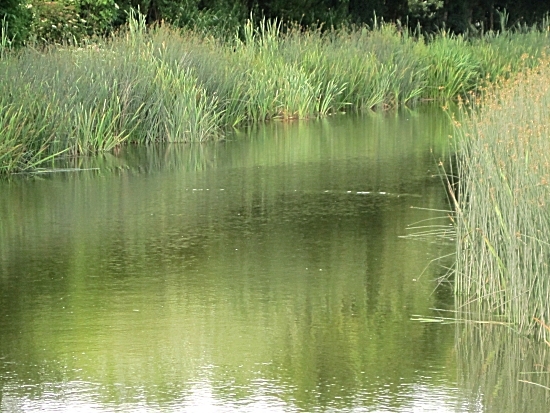 They knew that they had left the canal system in a better condition than when they arrived!! Although quiet on the journey, we all know that they were secretly planning their next even more dangerous and daring narrowboat mission! !